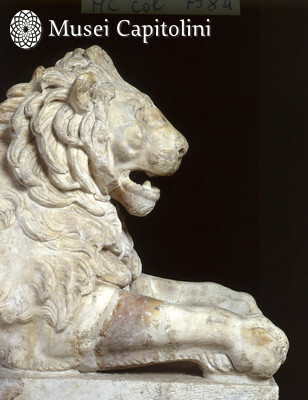 This lion is shown crouching: this is a rather uncommon feature in antiquity and the pose may have been altered by modern restorations. Lions like this are most frequently represented squatting, standing on four legs or leaping forward. The muzzle facing forward is also uncommon, as it is typical of seated lions; in most other cases, the muzzle is turned on one side. The lion is crouching, with the fore-paws stretched out, while the hind-paws are gathered under the body. The tail flanks the right hip. The stylistic manner of the mane appears to follow a highly decorative taste, as evidenced by the engraved lines which separate the hair on the chest and the sculptural highlighting of the single locks on the sides of the head. While the overall characters and execution of the treatment of muzzle and mane are reminiscent of late classical models, the unusual recumbent position, with the muzzle in line with the body, might suggest the stylistic influence of Egyptian lions, some examples of which were found in Rome as well. Such models could therefore be referred to for the choice of the crouching position. This valuable work has so far been ascribed to the 2nd century AD. The sculpture was probably found in Rome, but nothing can be said about its original context, which could have been a tomb, as well as the entrance of some unknown building. In the early eighteenth century the lion was in the collection of cardinal Alessandro Albani and was purchased for the Capitoline Museum in 1733.